This post includes affiliate links. At no extra cost to you, I earn a small commission when you purchase items I use by clicking the links below. Let's not kid ourselves, most adults aren't thrilled to go to the dentist. I have to admit, I used to be one of them. In a surprising grown up twist, I will take my floss scolding for a little dose of quiet time to myself. I love my kids, but any stay/work at home caregiver of littles knows how golden 30 minutes of time is for uninterrupted thoughts. But enough about me, I'm here to share how proud I am of my 3 year old for her bravery during her last visit to the dentist. I will share some play ideas, as well as some easy toddler preparation tips. This post will share information about her third visit to the dentist, which was a couple of months after she turned three. You can read in greater detail how I helped prepare her and supported her for her first two dental appointments here. A couple of weeks leading up to her appointment, I sprinkled in fun teeth brushing activities and dental play into our dose of play fun. When we got a few out from her appointment, I had mentioned she was going to the dentist again soon. But truthfully, she turned three not long ago so I chose to remind her of the appointment only the night before. 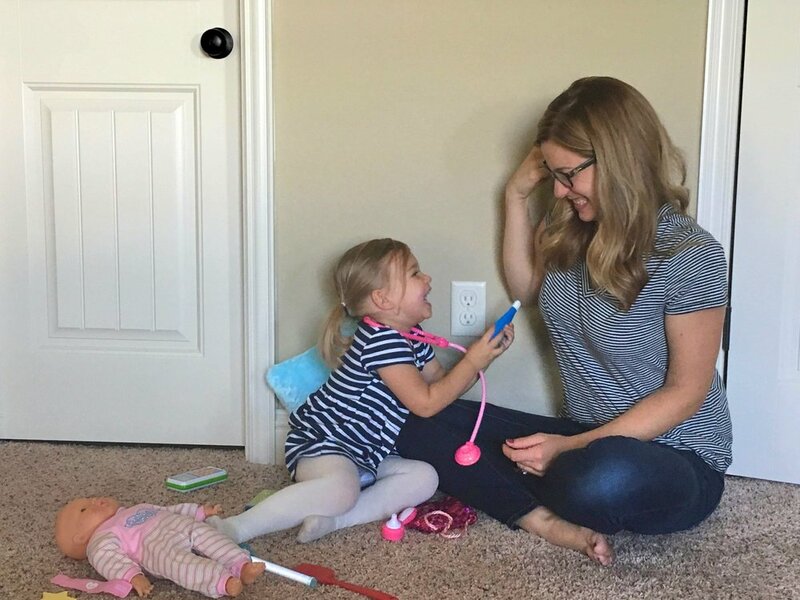 For toddlers, it's best to tell them just a day or two prior to any medical visit as they don't understand the concept of time and may be more worried if told too soon. So technically she might be considered a preschooler now, but even at this next age range kids have yet to master concept of time. I knew my daughter would understand and cope best if I told her about the visit the night before. This way I can explain, "tomorrow after breakfast, you are going to the dentist for a check up." Flashback to Olivia's last appointment 6 months ago, when they quietly informed me they they would introduce the "the drill" during her next appointment. I knew they were referring to that spinning hand tool that resembles a mechanical toothbrush. I also knew I wouldn't be calling it a drill. 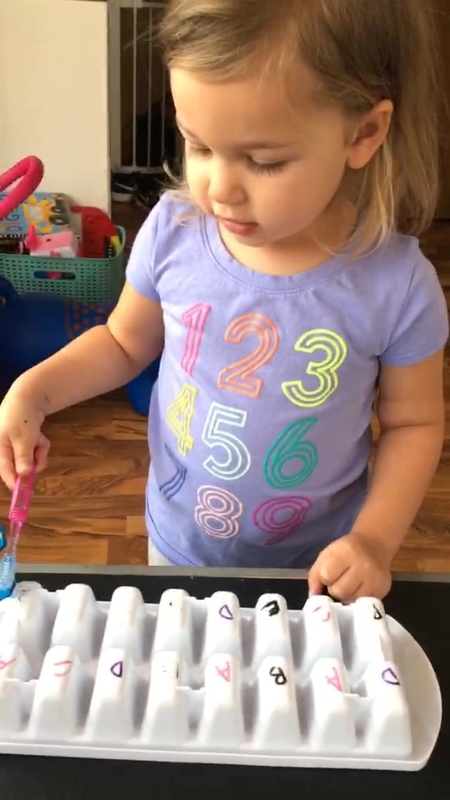 Anyways, it's probably no surprise to many of you that at 2 1/2, she wasn't yet warmed up to those mechanical toothbrushes they had given us at her previous appointments. Nowhere near her face and she still didn't like it turned on. Before I get to the play ideas we did to help make teeth cleaning fun, here is how I warmed her up to the hand tool. I turned on our mechanical toothbrush every now and then during our bedtime toothbrushing & nighttime routine and showed her how it worked in my mouth and acted extra silly. I started out by not bringing it near her face or asking her try it. I said the "spinning toothbrush gives my teeth fast tickles" while it cleans. My daughter loves this playful language. Simple, "soft" (child-friendly) language is what really helps the little ones feel at greater ease with medical items, such as under arm thermometers or these hand tools (technically called a "hand piece"). We related the noise it makes to how "super fast" it works. She gets a kick out of being "fast" herself, so this made sense in her world and amused her. I put the mechanical toothbrush to MY finger to show her it doesn't hurt (+ giggled) and then put it on her finger. Play is how kids process and learn, so it helps incorporating medical themed play prior, during, and after medical appointments. It can familiarize children with equipment and send the message that visits to the dentist are important to help keep their mouths/teeth healthy. It shines a positive light on the visit, rather than it seen as negative and a punishment. Another benefit is that often medical related play increases their cooperation and compliance with healthy habits, like teeth brushing or visits to the doctor. One reason for this is the child has gained the opportunity for control, which is a highly effective coping mechanism for children - especially toddlers and preschoolers. 1. Play-doh Doctor Drill 'N Fill. Olivia spent hours doing it the first day I gave her the new toy. What I tend to with my kids after birthdays or holidays is stash away some of the toys. I find that Olivia is more creative with her toys and uses them MORE when there isn't every single toy available to her that she owns. Not only is it less overwhelming for us to clean up every day, but it makes the most sense for us as a family financially, too. 2. Mr. Potato Head teeth clean. I gave her some extra brand new toothbrushes I had found stashed away in a toiletry bin and colored spots on the teeth piece with DRY erase markers. 3. 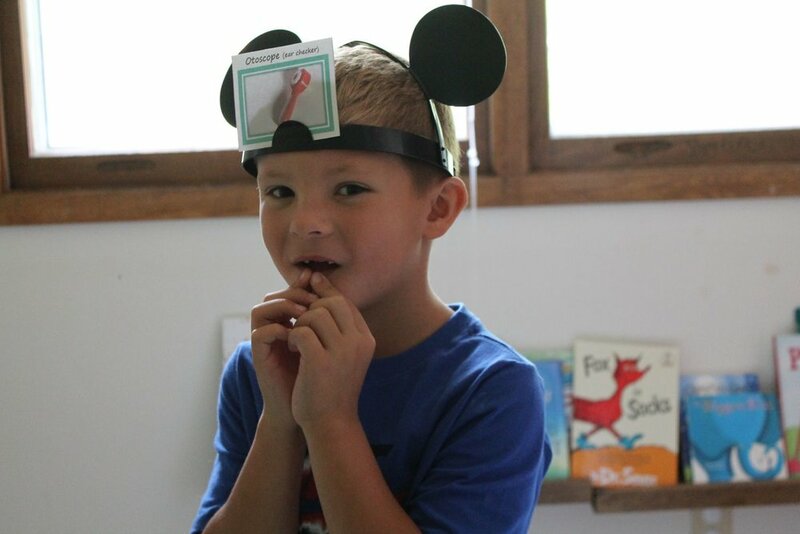 "Monster" teeth brushing/letter recognition game. Simply turn over an empty ice cube tray and write a few letters with a dry erase marker. I would call out a letter and she would try to find a match. I chose to stick with a small selection of letters at a time. You could also focus on shapes or even just colors. 4. Refrigerator mouth shape recognition game. You probably already guessed that you just need that extra play toothbrush and dry erase marker for this one! This was by far Olivia's favorite game. She was very meticulous about cleaning the shapes off and I kid you not, she was WAY more into brushing her own teeth the following days after! 5. This last one is a nod to my previous Dose of Silly Play post. Prior to starting these dental play activities, I was having a hard time getting her to brush her teeth seriously. I turned it into a game and pretended I saw a "pink monster hiding on the top!" And I would say, "Look way in the back, hurry, there's an orange one!" She loved it and brushed better than she ever had before! Since then, she often starts this game up herself and excitedly names different colored "monsters" she sees and brushes them away. Win! 1. Bring her favorite comfort item or toy for her to squeeze and play with for distraction. 2. Offer her choice to wear sunglasses to help block the bright lights (and make her feel more comfortable/less intimidated). 3. Choice of comfort hold (i.e. sitting in your lap) vs sitting by herself in chair. 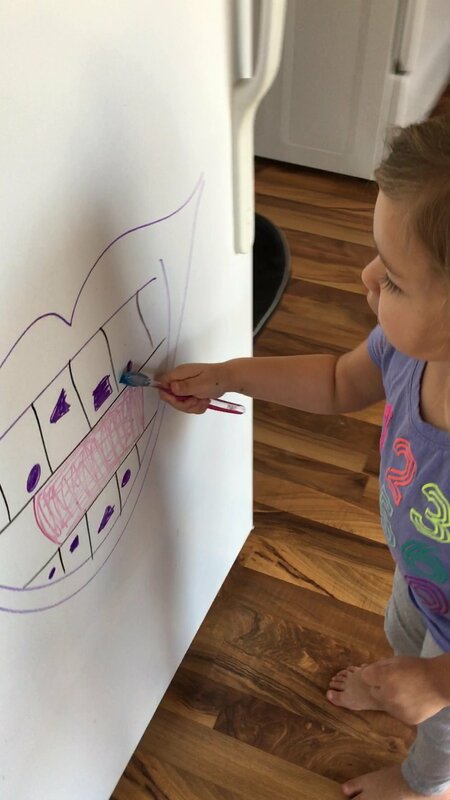 **More applicable tips in my previous post "How to help toddlers cope with dental exams." On the day of her visit, Olivia was a little nervous and that's okay. It's important to validate and reassure kids that it's okay to feel nervous. Then remind them of what you can do to help make them feel better, like the few examples above. Try to remain calm and supportive. If you need some silly play ideas to help them feel more relaxed in the waiting room or as you enter the exam room, visit my popular post "10 Ways to Get Silly with Little Kids." Even if the visit doesn't go down as well as you hoped, highlight something specific that the child did well, even if all you can say is "I saw you trying really hard to hold still and be brave." Afterwards, Olivia announced "I was BRAVE at the dentist!" We always celebrate with a lot of praise! And great news - health teeth so far!